It’s Holi today – the festival of colors, the heralder of spring, the day of warm hearts. You can’t debate the timing here. Any sooner and it would be too cold to enjoy the colored water your friends are going to drench you in. But right now its spring in the air, and the weather’s perfect – just the time to play with colors and pack away those winter grays. Color is just one of the three highlights of holi. 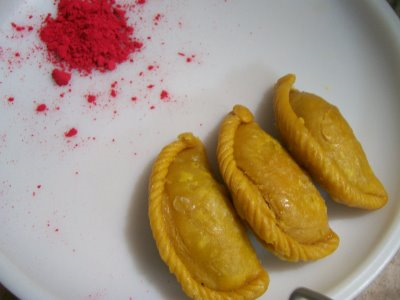 The other is the gujiya – half moon shaped patties filled with sweet mava (thickened milk) and nuts. Mine is store bought, but who cares as long as it tastes perfect. And this one does! The third point on the holi triangle, not featured here (and never tried by me), is the bhang. No other time of the year and nowhere else would you openly grind cannabis leaves into a thick milky liquid that gives you a high quite unlike alcohol or drugs (or so I am told). But this is just the day when rules don’t work; one day made only for fun. So go ahead – pick your color and welcome spring! Hi, Came through Bharathy's summary on Arusuvai. Neat n clean blog!! I made gujiyas too! I could not twirl and twist the edges but the taste was really nice! My link to the North!